If you need a little help combining your portraits into one document once you’ve created them, pop over to this tutorial. Easily creating unique, hand drawn custom portraits that will wow your clients, impress your family and friends and even jazz-up your blog. 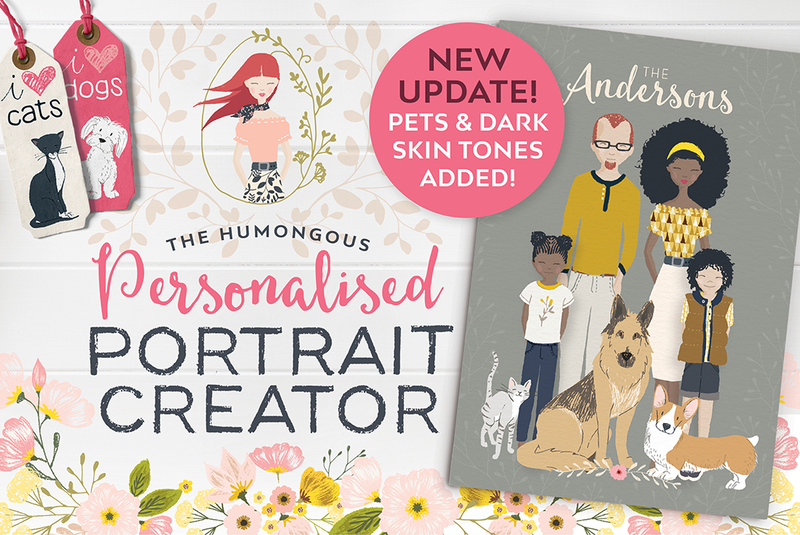 I’ve updated the set to include children and pets, which means creating a custom personalised family portrait couldn’t be easier. The set is available in my shop which you can find here. Will there be a expansion pack for body types? Hi Mary, Yes I’m hoping to start of a fuller figure option for the woman and man portraits soon! Hey, I’m not seeing a lot of the options in the pack I just bought that you have in your video. For example: jeans & tank top, any of the dresses, leggings, eyes, mouth, etc. Am I missing something? Hi Lisa I purchased your original Portrait Creator in a Bundle in June 2016 through Design Cuts, will I still be able to get the updates Free as well? Hi Teressa, If you purchased the product via one of their bundles, although it’s not usually standard practice to update bundle products due to the low price of the purchase, I still want the bundle customers to benefit as well, so Design Cuts and I have set-up a special rate for bundle customers. For a small additional fee you can get all the new updates I’ve added since you bought the kit. Hope that helps! If you have any other questions at all, please don’t hesitate to let me know. I saved these portraits as Jpegs but when I go to upload them to walgreens or shutterfly they say there is an error and that type of jpeg isn’t supported? How should I save them so they can be printed? Also is there a better place to print them? Hi Bryana, It’s more than likely the colour mode that Shutterfly doesn’t “like”. So under the Menu Image > Mode, make sure you have converted the colour mode to RGB and resave your jpeg and try again. If you have any other questions at all, please don’t hesitate to let me know. and my cousin with her golden retriever but there is none. Also, will you make another figure for men and women which is between the thinner one and the medium figured one? Also, how to I merge these created portraits with one another without having to copy all the other layers? So sorry to hear you are disappointed! I do try to include all the pets that are available in the pack in the previews as I know there are many breeds that aren’t included even though the set has 68 dogs. I am hoping to add more to the set in the coming months. Is there an option for pregnant women? Is there a tutorial on how to apply patterns? Does this not work for Creative Cloud PS? Yes, this will definitely work in Photoshop CC. I’m trying to upload through actions but it just takes me to each individual file and won’t let me select them? I could use some help getting the program onto photoshop! Sorry to hear you are struggling. This is not an app or action, but rather photoshop documents you open up Photoshop, So once you have the folder of the Photoshop version expanded, navigate to the Portrait you’d like to work on. 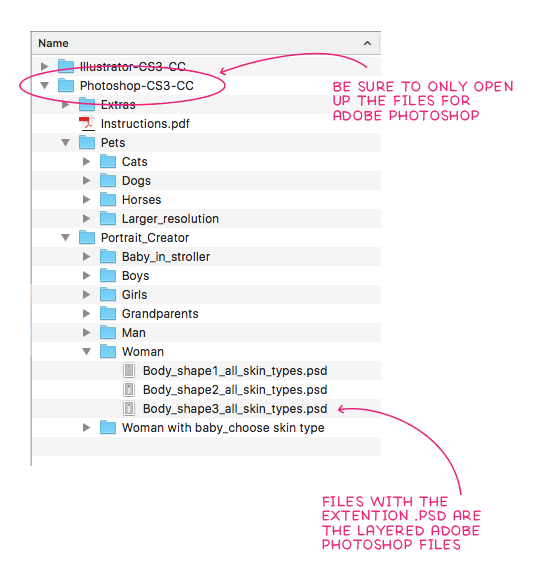 Select your file (like Woman body type 1 for example) and double click the .psd file to open in Photoshop. The .psd file should automatically open up once double clicked. But be sure that you are opening the .psd files and to the Illustratior files (.ai). The tutorial video above takes you through creating your first portrait. You can also read the PDF instructions included. I’m having a problem with any of the extras, (dogs, flowers, patterns). The only thing that will load into photoshop is the people and pre made backdrops. it wont let me drag and drop or open any of the others. Please help!!! The extras for the Adobe Photoshop version are PNG files. These won’t open the usual way by double-clicking. So the best way to open them would be directly from Photoshop, which would be File > Open… then navigate to the item you’d like to open and click Open. From there you can drag their layer into your working doc so they appear as new layer in that document. Hope that helps! I just downloaded, and I don’t have any of the options for clothing that you show in your tutorial. 🙁 I also don’t know how to change colors of things in PS as it’s different in the program you use. I’m doing my son currently and he’s got like 3 shirt options and either shorts, or pants. I don’t see any legging options for women either. 🙁 Help. The video tutorial takes you through changing colours of items in Adobe Photoshop at the 5:00min mark. Although most of the tutorial is in Adobe Illustrator, I do flip between Adobe Photoshop and Adobe Illustrator if the processes are different. So at around 5mins in you will see how to change the colour. To answer your clothing question, I used body type 2 of the woman in the tutorial. Body type 1 has slightly different clothing to body type 2 and 3 – these two were the newest bodies I added plus they have more outfits. I am hoping to add these same outfits to body type 1 in the new update. For the children, they won’t have as many outfits as the adults. I try and work on the most requested items in the updates and by far it’s always more outfits for the adults. But this is an ever expanding kit and I also add any suggestions I get to my list so if there’s anything specific you would like to see for the children please do send me your suggestions. Hope that answers your questions. If you have any other questions at all, please don’t hesitate to let me know. Do you know when you’ll be adding the other clothing options to body type 1? Any chance of a military character? I will definitely add your suggestions to my ever-growing list of requests – I try and include the most requested items in the upcoming updates, or possibly create additional add-ons to purchase separately. Hi just purchased the PPC I am using it with PS CC. I downloaded initially worked on one portrait and had no problem I started a second person and I don’t have any options to personalize? Any ideas on what happened? I re-downloaded a second time to see if that would correct it but no avail. I cant double click on the body type to get the drop down additions. Any help would be appreciated! Sorry to hear you are struggling. When you double-clicked on the second portrait, are you sure you choose a PSD file and not an AI file? For Adobe Photoshop just be sure you are only opening up the files with the extension PSD. If you’ve managed to create one already, I can only think that it’s perhaps the wrong file you are trying to open. If you’re still struggling, please do send me an email and perhaps a screenshot of the files you are trying to open so I can assist you further. Email: info@lisaglanz.com Thank you. How do we change the color of the hair without losing the “strands” detail in the hair? When I fill in with another color, it becomes one solid color! I’ve had to work around this by selecting two different hair colors, changing the color in one of them, and then bringing down the opacity. Is there an easier way? (I’m using Photoshop.) Thanks! You can use the Hue and Saturation tool in Adobe Photoshop or the Color Balance tool – you will find them both under Image > Adjustments. That way when you make adjustments you are adjusting all the elements on that layer and changing the hue of them as appose to filling over them with a flat colour. Hope that helps! Happy creating your portraits. So happy your are enjoying creating your portraits! At this stage the new body types 2 and 3 don’t have the additional arm option, but I will be including that in the upcoming update. Also thank you for your suggestions, I will add your suggestions to my ever-growing list of requests – I try and include the most requested items in the upcoming updates. I am trying to change the clothing colors and I have the locked the transparent pixels like you said in the video (I’m using PS) but when I change the color, it is changing the entire piece of clothing. Hi DeAnna, I tried to replicate your problem you mentioned so I could assist you better, and the only way that happens is if I don’t lock the pixels, or create a empty new layer that has nothing on it. So the only thing I can think of is you might not be locking the pixels on the actual layer you want to change. Or you are using the Edit > Fill menu instead of the colour overlay option in the layers panel. Be sure to select the layer you want to change and not the entire folder. And double check that the pixels are locked before applying the colour overlay. Hope that helps! Hi, Thank you for answering this question! How is that done by changing the color overlay? I was using the Edit, Fill option you have in the video, but it keeps changing the entire piece of clothing. You will find the color overlay effect in your Layers panel right at the bottom (the little fx symbol). Remember to only select the individual dress item and not the entire group, so expand the dress group and look for the dress layer, exclude the belt or button or other details otherwise it will change the colour of the entire outfit – have another look at the video to see which layer I selected. Once you have the correct layer selected, click on the fx at the bottom and choose color overlay. From the pop up you can select a new colour and click OK.
Is it possible to use this package in CorelDraw 2017? So sorry but unfortunately I can’t say for sure if it will work in CorelDraw as I don’t have the software. The Adobe Illustrator files in the kit have very complex layers and sub-layers, so I’m not sure if CorelDraw will retain that once imported which is crucial to creating the characters. If you have any other questions at all, please don’t hesitate to let me know. Will you be adding any disabled aids in the future? Looking for a child in a wheelchair if possible! I LOVE this! All I need is Photoshop to use it? Hi Lynn, Yes 🙂 You need Adobe Photoshop CS3 or newer. If you have any other questions at all, please don’t hesitate to let me know. Loving it! I’d love to see a pit bull in the dogs in the future. My only complaint right now is that with women you have the choice between rail thin, round, and rounder. I’d love to see a little curvy. The size of body style #2 but with a waist more accurately matches most of the women in my life. But otherwise, this is such a fun set. And thank you so much for your feedback regarding the body shapes. I really appreciate any and all comments so I can work on the most requested items for future add-ons or updates to make the product even better. Hope you continue to enjoy the kit! Hey Lisa, I absolutely love you Portrait Creator! I have not yet purchased it, but and very interested. I recently purchased a Cricut and feel fortunate to find your site! I wonder which program do you suggest is the best for a beginner? Adobe Illustrator or PhotoShop? So happy you found my site too 🙂 I would recommend Adobe Photoshop for a total beginner. It’s a little less overwhelming if you stick to the basic tools. If you want to challenge yourself Adobe Illustrator is a fantastic app to learn. In terms of graphics and editing graphics and clipart, it’s the best by far for vector work. Hope that helps! Hello there, so glad I found your page I am interested to purchase this. Will it work in Adobe Photoshop Lightroom 5? I tried to read through the threads but didn’t see it discussed. Thank you so much! So happy to hear you are interested in the product! Unfortunately this kit won’t work in Lightroom. You need either Adobe Illustrator or Adobe Photoshop CS3-CC to use the files. Hope that answers your question. If you have any other questions at all, please don’t hesitate to let me know! I just purchased in Creative Market and want to say this is brilliant! So fun to play with!! Thank you so much for sharing such a wonderful set of drawings. Hope you continue to enjoy creating your portraits! You are only going to expand the Photoshop-CS3-CC folder. You could actually remove the Adobe Illustrator folder entirely if you aren’t going to ever use the Adobe Illustrator version on your computer. So all the files within the main folder called Photoshop-CS3-CC are the ones you will be using. Hi I have just purchased the portrait creator and keen to get started. It is not something I have used before in Photoshop, I am used to images. I am probably being a bit dumb but I cannot work out how to actually get the folders to open up in the Layers panel so I can get started. Can you please point me in the right direction. Many thanks. Thank you so much for your purchase, it’s much appreciated! You can just simply double click on a portrait file with the extension .psd. In other words, you don’t need to import anything, just simply open up a portrait you want to work on like the Woman “Body_shape2_all_skin_types.psd” for example. Once you have that open in Adobe Photoshop, you can expand your layers panel and start playing around with turning layers on and off. Hello! I just bought this package and i’m so excited to get started! How do I combine more than one portrait to create a family portrait? Thanks for your help! Hi! I am LOVING playing with this. I’m just getting started by creating myself. Body is done and working on accessories. Is there a way to change the glasses color? I see that the kids have a dark medium sized frame but the woman has pink ones. Glad you managed to sort it out 🙂 So happy to hear you are enjoying the set! When I copy the pets into a new picture, the colours spill out as they have no outline. What am I doing rong? We popped you a message on Facebook as well, I’ll just include it here too incase you missed it. So sorry to hear you are struggling with placing a pet in Adobe Photoshop. I haven’t come across such an issue in the past, it looks like a technical glitch from your image you sent. Have you had this happen before, or has it only occurred in this new document you’ve created? It could have something to do with how the document was set up. I suggest trying a new document, maybe one of the pre-made backgrounds included in the kit. If it happens again in that document then it might be worth restarting the computer and Adobe Photoshop. I also recommend rather dragging and dropping the PNG file into your working doc, rather than copy and paste. So all you need to do is have your PS doc open in the background, then from your files on your computer, select the cat and drag and drop into the PS doc. Hope that helps! Let me know if that works. Hello! I LOVE your product!! Do you have additional packages that can be bought that include more wardrobe choices – looking for additional wedding dress and formal options as I’m a wedding photographer and want to create these for my couples as a special gift. Thank you! I’m loving this latest update but I was hoping to add a few requests to your probably never ending list is there a pregnant lady? I thought there was but I can’t seem to find her:.. as far as requests, medium length curly hair for women, and wavy options for all! Glad to hear you are enjoying the latest update! There isn’t a pregnant woman at this stage, but I will be creating one as an add-on in the new year along with a few other add-ons as well 🙂 Thank you for your hairstyle suggestions, I’ve taken note of all of them. If you have any other questions at all, please don’t hesitate to let me know. How do I merge a photo with a frame for blog purpose? You can use Adobe Photoshop to clip your photo inside the frame (I’m assuming that’s what you meant 🙂 So to do that, make sure you have the PNG frame open in Adobe Photoshop. Also have your photo open then Select All and Copy your image. Then head over the frame PNG file. Using the magic wand, make a selection of the inside of the frame by clicking anywhere on the inside of the frame – you should see a selection of just the inside. Then go to menu Edit > Paste Into. This should automatically paste the photo inside your selection you made. Are there really only 3 body shapes? I wanted to make myself. Opened shape 2. “Hm. I’m not quite that rotund. Let’s check out 1. WUW! Not that skinny!! Not by half!! How about 3. Even fatter than 2?? What!? Do you truly have no body shape for a normal, average, not super-skinny but not at all fat either woman? Aside from that, I’m really excited to make my family. Thanks! This is such a wonderful program. Thank you for sharing your talents with us in such a user friendly way. My question for you, is stemming I’m sure from my ability to overthink. What have you found is the best way to print the files? When you send them to the printers flattened, what product do you find works best so that the texture shows well and gives that faux handmade feel. Thank you for any tips you can share. I have a couple gifts to print out. Definitely send the files flat, this will keep the files size down and make it easy to do universal colour adjustments if needed. For paper and colour mode settings, I would recommend a card stock that looks similar to watercolour paper – a slight textured, uncoated matt card works really well, it gives it that authentic hand drawn look when printed. Also remember that some printers prefer RGB and some CMYK so it’s definitely best to convert the colour mode of the artwork file to suit the printers request – so definitely check with them first. The file is by default CMYK in Adobe Illustrator and RGB in Adobe Photoshop. If you need to convert colour modes in Adobe Photoshop go to Image > Mode > and choose CMYK. Remember to Save As to preserve the original file. If you’re using the Adobe Illustrator version of the kit, you can enlarge the portraits to any size without losing quality due to the nature of vector artwork. If you are using the Adobe Photoshop version I wouldn’t enlarge more than 140% of the original size. Depending on the doc size you created, you could probably safely print it to A3. You can always do a test print at home by enlarging the file to the size you want, then just print a quick sample – even if you don’t have a large printer, you can still print just the area your printer can see, so don’t select “Scale to fit” just leave at 100% and print that portion of your portrait. If you’re happy with the results, it should be fine when you send to a professional shop. I also recommend doing a cheaper test print at the print shop before committing to expensive paper or canvas. Could you make people (both adults and kids) in wheel chairs or with crutches? And an add-on hearing aid would be awesome as well! A wheelchair option is definitely on my wish list as it’s something I’d love to include in the set among other things. The biggest hurdle I face is the challenge of recreating the entire kit for each age group and gender in the new position – the current kit took over a year to create so it’s a fairly time consuming exercise. But as mentioned, it is on my list and is something I would love and hope to offer in the future. Do you have have a body type for mother’s who are expecting?